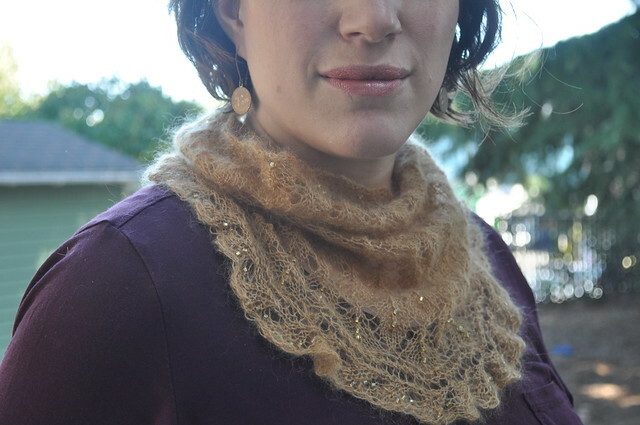 Notes: This pattern, while simple to knit, is not good for new lace knitters. The charts do not note when a marker should be moved which is very, very often and it can be puzzling when you're not paying close attention. You just have to do it by instinct. A Mitered Crosses blanket* draped across a sofa? Lovely. A Mitered Crossed slung over your shoulders? Awkward. A visit to Seattle's gum wall? Disgusting but fun. 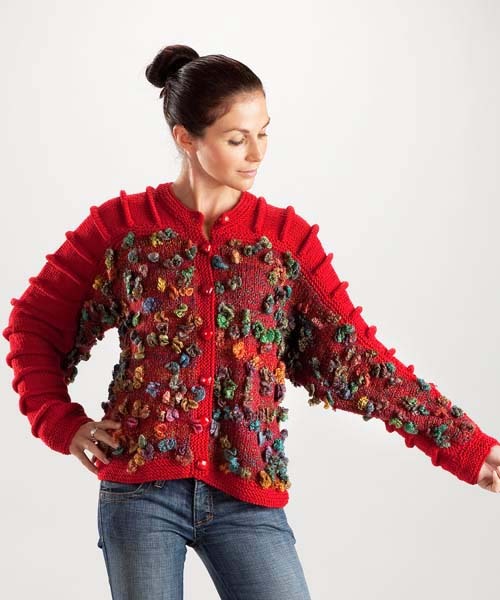 *By the way, you should totally buy this pattern and knit it right away because it is so much fun to knit. I got my cowl finished last night. It's blocking now, photos later. Your comments were so nice but I didn't tell you that I started the cowl on July 7th. So the fact that I let it get down to the wire and blew the deadline was pretty bad on my part. You can see more on the swap on the Purlygirls Ravelry group. I hate missing deadlines. I was mortified tonight at Purlygirls when I was the only person who didn't finish our first-ever cowl swap on time. I ended up going out of town this weekend (Vancouver BC! Woot!) and couldn't knit lace with beads in the car. 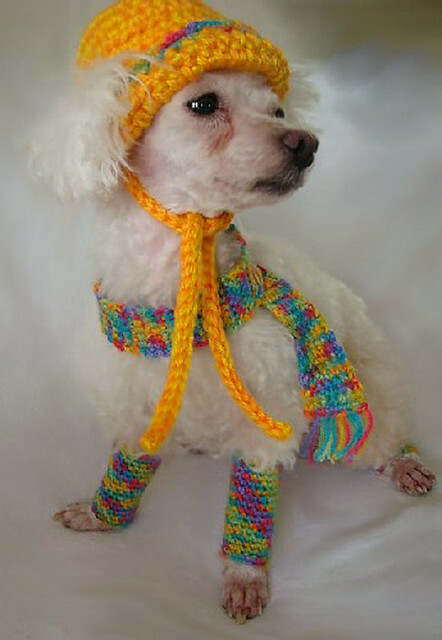 I'm still feverishly knitting and will get back to you shortly. One for Mommy too. This is the Chameleon colorway. She just blends right in, doesn't she? "I'm going on a bulky, acrylic safari. In shorts!" I'm about to venture into hazardous terrain. I've been there before and we haven't always seen eye to eye. 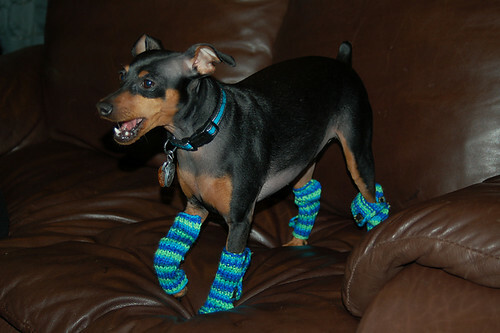 I'm talking about knits for pets. In this case dogs. As I see it, and I know some of you will disagree but as my father used to say, "That's what makes horse races," dogs have fur. They have been designed by nature to withstand weather. Just like a bear, lion or ape they can go about their business in the outdoors without being bundled up in sweaters. I know there are many breeds that nature did not have a hand in and those breeds do have a hard time retaining their body heat. Some dogs might like a coat from time to time, I will concede. But no dog ever asked for this. Is the dog cute? Absolutely. Does its owner love it? I'm sure. 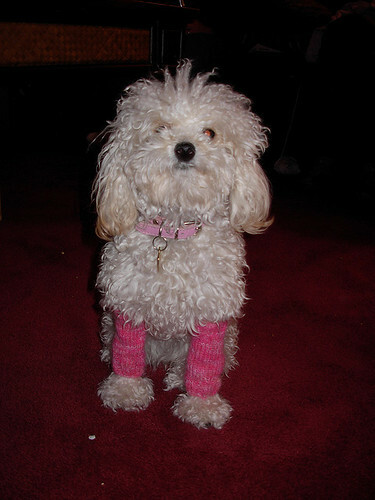 But what are those leg warmers supposed to be doing there on those dog legs covered in completely good fur? Then I realized, "Sweet fancy Moses! It's happened. 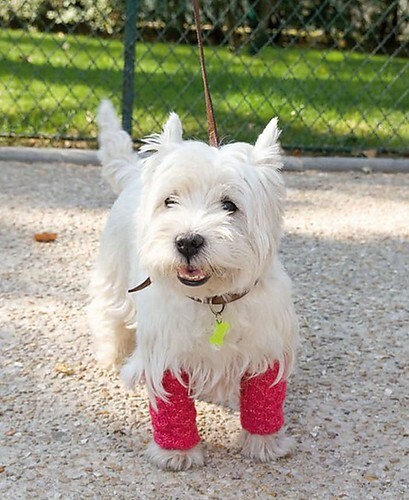 We live in a world where people dress their dogs in leg warmers just because." A brief search showed me that it was true. And once you start accessorizing can you ever stop? The preview is up. See anything you like? Now that my Ravellenic Games knitting is over I got back to my Narwhals. I finished them last night and I was proud of myself. I soaked them this afternoon and just laid them out to block. Then unleashed a stream of expletives that seemed to shock even Wes. Yes, I left out one chart on the second mitten RIGHT ABOVE THE CUFF. ARGHHHHHHH!!!! Notes: Please forgive the crazy hair and completely wrong shirt, I was trying to get a picture up for the Ravellenic Games. 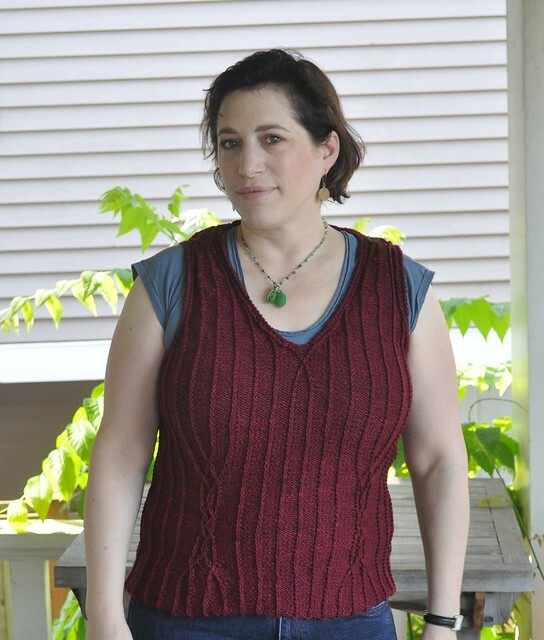 I knit this exactly as written except that I think at some point I started doing one of the twisted decreases wrong. 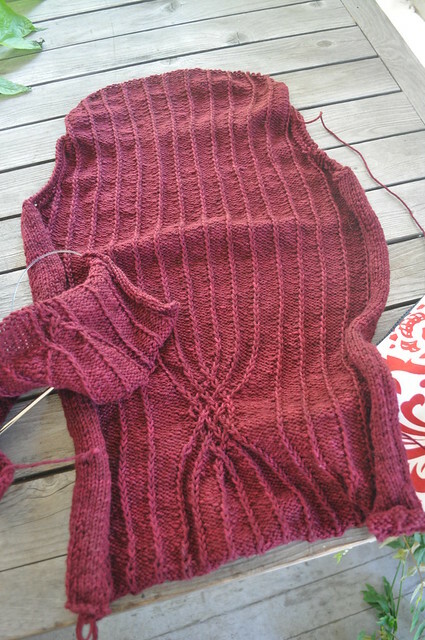 One side of my neckline has crisp lovely twisted decreases and the other side...not so much. Have you never heard of mittens? Or gloves? 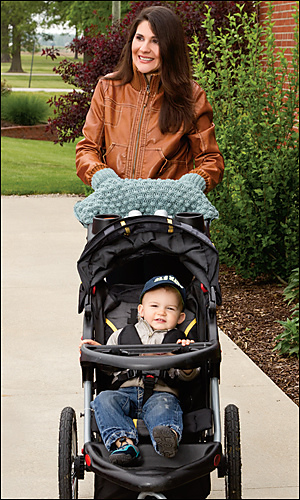 In what context is this the best and easiest way to keep your hands warm while pushing a stroller? Why is this happening, Edward Bobblehands!? Man, I've been really bad about blogging lately. 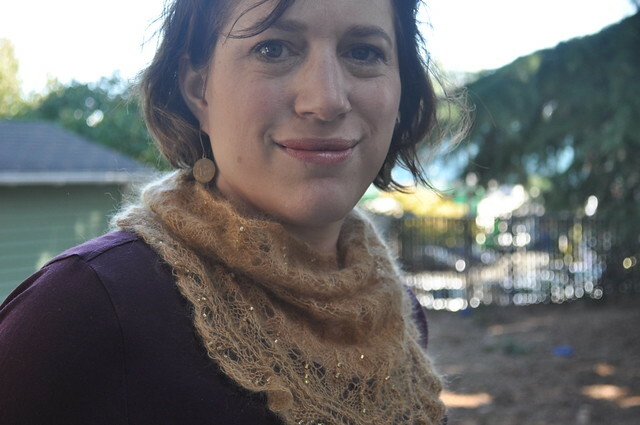 I picked a project for the Olympics, Streamside by Cecily Glowik MacDonald. I bought Miss Babs Yowza in Catherine last year to make it. Then I swatched it just before the Olympics and found out it's too thin for the project. I made a quick change to Angostura by Ysolda Teague. The Olympics started one week ago and I've finished the back and gotten started on the front. I should finish in time so long as nothing huge gets in my way. 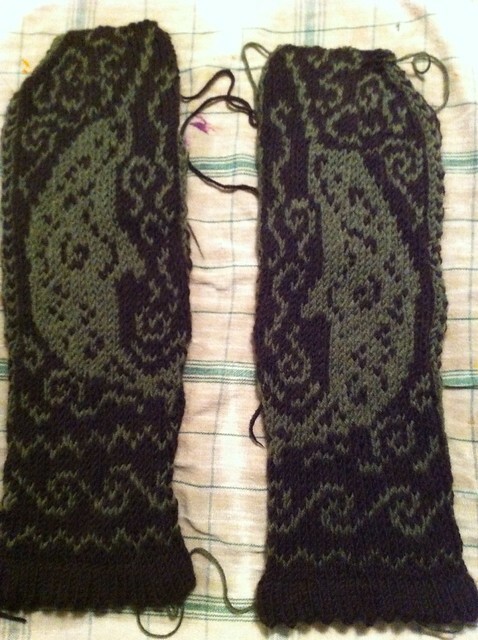 Just before the Olympics started I pulled out my Narwhal mittens, also by Ysolda, and got going on them again. I had already finished the first one (minus the thumb) and knit the cuff for the second. I am about 1" shy of finishing the second mitten and was knitting on them furiously last Friday before the Olympics started. I'm really looking forward to finishing this vest so I can back to finishing those mittens. Ugh. I'm tired. It's already been a long week. I just didn't have the energy to put together a Thursday post. But fortunately for all of you there are some posts that just write themselves. 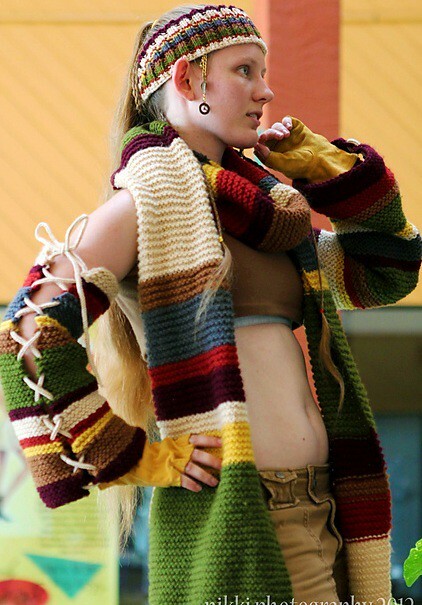 Yes, it's that arm cozy with matching scarf and headband to wear with your fingerless gloves and crop top. Thank goodness because I was really at a loss on how to accessorize.